Dream Pod 9: DP9 Attending the GAMA Retailer Tradeshow! All of our Kickstarter backer reward packages will start shipping in late May and we plan to have all 4 waves shipped out by the end of June. Retailer and Distributor orders for the New Edition Quick Start Rulebook and New Plastic Miniatures Army Boxes and Two Player Starter Box will start shipping in August following their official release at Gen Con 2016 in Indianapolis the first week of that month. Below we have an image of the sales sheet we made for retailers attending the GAMA Tradeshow next week with the 6 new retail products and pricing that are available for them to pre-order at the show for shipping in August. Here is the list of the new products and their suggested retail pricing, for all interested. 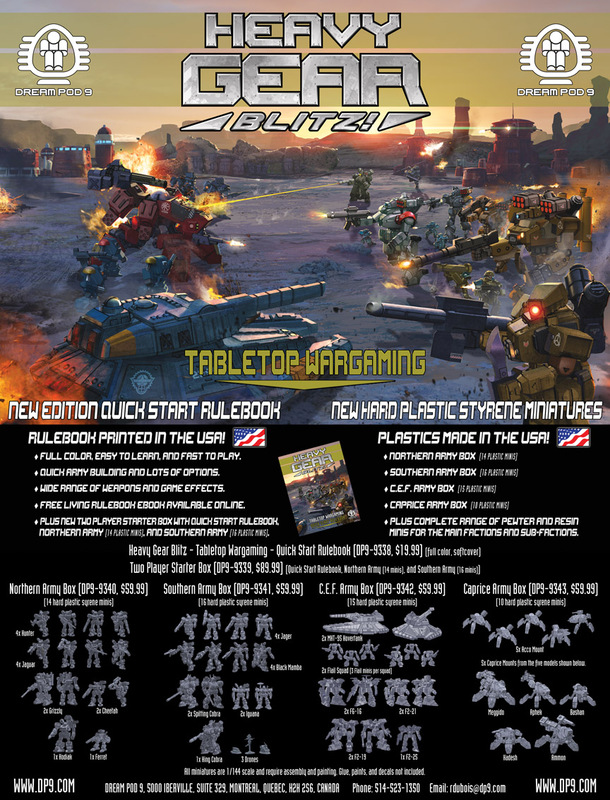 - Heavy Gear Blitz - Tabletop Wargaming - Quick Start Rulebook (full color, softcover) DP9-9338, $19.99 USD. - Two Player Starter Box (Quick Start Rulebook, Northern Army (14 minis), & Southern Army (16 minis)) DP9-9339, $89.99 USD. - Northern Army Box (14 plastic minis) DP9-9340, $59.99 USD. - Southern Army Box (16 plastic minis) DP9-9341, $59.99 USD. - C.E.F. Army Box (15 plastic minis) DP9-9342, $59.99 USD. - Caprice Army Box (10 plastic minis) DP9-9343, $59.99 USD. If your a retailer attending the GAMA Tradeshow next week stop by our booth, # 516, say hello and support us with a pre-order of the new edition releases. Checkout the new edition rules and the first test pops of the Caprice plastic miniatures part spures sent to us for approval of the just completed plastic injection mold. If your not attending the show, contact your distributors and ask them to stock the new edition releases and place a pre-order for you. Home › Blogs › Robert Dubois's blog › DP9 Attending the GAMA Retailer Tradeshow!